Andalucia is an intimate, gated community of 167 one and two-story, single-family homes for sale and home sites built around Lake Azzuri. Each of the 2,500 to 4,200 square foot Taylor Morrison homes feature terra cotta-style tile roofs that reflect the Spanish Mediterranean themed community. The community of Andalucia is reminiscent of its namesake, the European peninsula now occupied by Spain and Portugal. 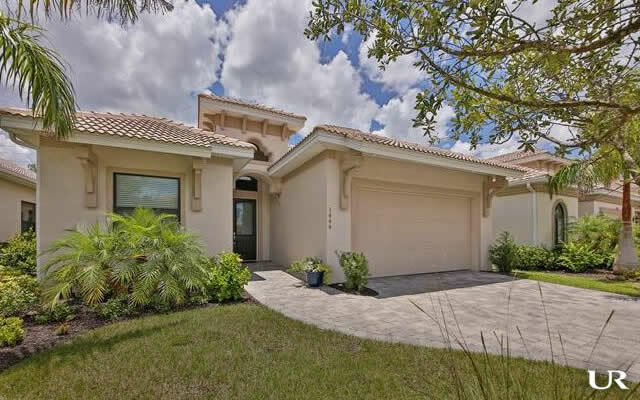 Andalucia is resplendent with the Spanish Mediterranean-style architecture that has been historically prominent and attractive to residents and buyers of southwest Florida real estate. The charming homes of Andalucia welcome residents the minute they drive through the front gates as they are greeting by elegantly landscaped homes, each with driveways and walkways made of interlocking pavers that accent the Spanish Mediterranean-style architecture. Pavers and decorative tiles also grace the rear lanai of each home as well. Unseen to the eye, each home comes equipped with a full property irrigation system in the front, back and side yards. And even if you don’t have a green thumb, professional landscape maintenance service keeps the entire neighborhood looking uniformly groomed and perfectly manicured. The earth-tone, stucco exteriors are accented with light-colored trim and elegant columns, arches, porticos, loggias and decorative scroll-work. Covered, ornamental wrought iron balconies are an available feature of the two-story elevations. The exteriors are only a foretaste of the design and décor of the interiors, where Andalucia homes fulfill the expectations of everyone who enters through the ornate, Therma-Tru® front doors. One step inside and the elegance becomes evident with 10-foot ceilings, tiled floors arched doorways, 8-foot interior doors and trowel-finished walls and ceilings. Andalucia real estate is representative of the Naples lifestyle where classic architecture meets modern amenities like granite countertops with stainless steel under-mount sinks, in-kitchen breakfast bars or islands, and Whirlpool Energy Star® appliances. Raised-panel wood cabinets are featured in kitchens and bathrooms. Every Andalucia home is equipped with a structured wiring package that includes a central distribution panel for phone, data, and cable TV, as well as a home security system with two control panels. But Andalucia is more than individual homes. Andalucia is a community within the larger community of Naples. Andalucia community amenities include a lagoon-style pool, hot tub, a safe children's playground, and a half basketball court accessible adjacent to the community clubhouse. The clubhouse provides residents with a modern fitness center equipped with state-of-the-art cardio workout equipment, a game room, a catering kitchen for family or community events, and a gathering space to host those events. Andalucia is like living a dream within a dream. When you leave the dream of Andalucia, you are still in the dream called Naples, one of the most beautiful cities in Florida, featuring some of the finest beaches on the Gulf Coast, which are only five minutes away. Historic and captivating Old Naples in only an eight-minute drive, but one does not need to go that far to find upscale shopping and dining. Those amenities are only a minute or two outside the gates of the neighborhood. The Naples community of Andalucia is an intimate collection of three, four, and five bedroom homes that offer an affordable, yet upscale lifestyle in one of North America’s most desirable locations.